Filipinos likes fiestas. They are celebrated all-year round. All over the country, especially in the summer months. "May is the merriest and the most beautiful month of the year. It is the season of colorful festivals and Flores de Mayo or Santacruzan is one such festival,"says Ms Maricon Basco-Ebron, tourism director and attache at the Embassy of the Philippines in Seoul. During the month of May, in the tropical islands of the Philippines, she went on to say:"We don't have to stop — the fragrance of flowers floats in the air. When the rains begin to pour after a long dry spell, flowers magically bloom overnight." And being predominantly Catholic, the Filipinos celebrate the beneficial rains by giving praise to the Blessed Virgin Mary. The townfolk gather the colorful flowers to decorate the Parish Church altars and aisles. They bundle the blooms in exotic arrangements for the many different festivities all together referred to as the "Flores De Mayo" (Flowers of May). Many towns celebrate Flores De Mayo with the community congregating in the afternoons to pray the rosary, offer flowers to the Virgin Mary, and share homemade delicacies and snacks. Children and adults wearing their Sunday best sing and dance to welcome the rains that will water the new crops. Santacruzan is held annually in the warm month of May and is considered to be the "Queen of Filipino Festivals." Beautiful town belles are selected to participate in this colorful pageant parade. The stars are selected not for their looks alone, but for their embodiment of traditional feminine qualities, she explained. 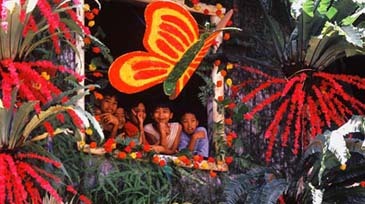 It is a week-long street pageant in almost every town; from the dirt road barrio to the metropolis honoring beautiful Philippine maidens and their handsome escorts under the hand-carried bamboo arc's decorated by fragrant native flowers. May is also the month dedicated to the Blessed Virgin Mary, mother of Christ. Filipinos turn each of the 31 days in May into a charming honor to the virginal virtues in Flores de Mayo, the flowers of May fiesta. Spiritual virtue searches to reach even the young. Every day in May, children, with cut flowers and baskets of petals in hand, march down the church center aisle. As the children march down the aisle they sprinkle the fragrant petals for Mama Mary. This custom is called alay sa Birhen. In Filipino, because it is an offering (alay) to the virgin (birhen), at the main altar, the youngsters sing hymns to Lady Immaculate, and leave their bouquet of flowers loose and dethroned. In the meantime, Pahiyas Festival is the time when people in Lucban, Quezon give thanks to San Isidro Labrador for a good harvest. Pahiyas means "decor." Every May 15, the fronts of houses are elaborately decorated with brightly colored rice wafer, called kiping, a type of rice dough made from a traditional recipes. Fruits, grain, vegetables, and woven palm hats are used as decorations. When the pahiyas festival is over, these kiping are cooked and eaten as rice chips. In Pahiyas Festival the San Isidro Labrador's image is carried across town in a procession to assure farmers of more bountiful harvests in forthcoming seasons. Later on to keep the tradition alive the townsfolk agreed to display their harvest in front of their homes where the parish priest would come to bless the harvest. Considered one the Philippines' biggest harvest festivals, it is deeply rooted in the traditional celebration of thanksgiving for bountiful harvests. Pahiyas Festivals is the harvest festival and is observed in the towns of Lucban, Candelaria, Tayabas, Sariaya, Tiaong and Lucena City. The Pahiyas Festival started as a gift-giving ritual by the natives of Lucban to the Franciscan missionaries who were responsible for bringing Catholicism to Quezon in 1583. The farmers believed that this rite was necessary because they were convinced that failure to observe it could mean drought, famine, and bad luck for the farmers in Lucban. As the farmers were showered with more blessings and the harvests increased as they observe Pahiyas Festival even more. Later into the Pahiyas Festival it becomes a free-for-all, grab-all-you-can affair with suman -sweet, sticky native rice cakes - as the center of contention. Whether you get handfuls or just a mere mouthful, the Mayohan sa Tayabas will leave you wanting for more - suman, of course! 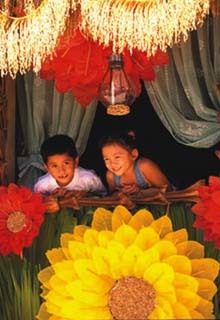 This and a whole lot more make Pahiyas Festival a heritage of Filipino festivity.